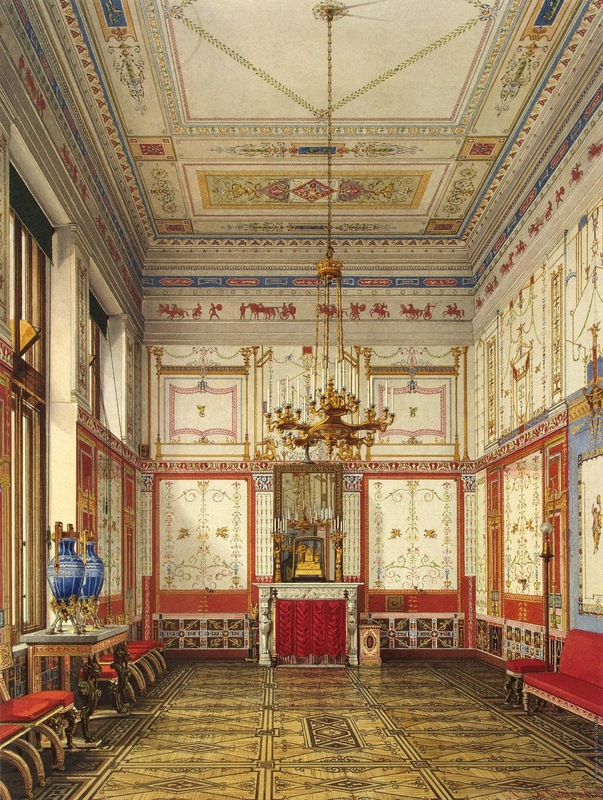 The growing interest by Russian architects with Pompeian design originated in the early1800s with a large number of artists and painters working in Italy. The architect Alexander Briullov studied in Rome and Naples in 1824-1825 funded by the Imperial Court. His book ‘Thermes de Pompéi’ was published in Paris in 1829. After the 1837, Briullov was appointed to supervise restoration works in the Winter Palace. In the early 1840s, Prince Albert commissioned Ludwig Gruner to oversee the decoration of a garden pavilion in the grounds of Buckingham Palace for Queen Victoria. 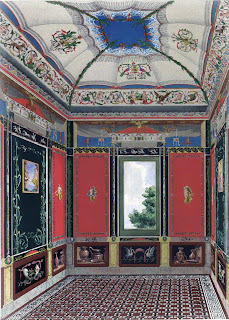 One of the rooms was a Pompeian Dining Room painted by the Italian artist Agostino Aglio. Did Prince Albert and Queen Victoria show the garden pavilion to Nicholas I during his visit to London in 1844? In the first Russian guidebook to Pompeii in the 1800s, the author noted that ‘the use of garish and contrasting colors strikes a modern spectator unpleasantly and requires a certain effort to comprehend it’. The color scheme of the rooms was one of the reasons why it did not agree with the later tastes of the public. The garden pavilion in Buckingham Palace has not survived and Briullov’s Pompeian Dining Room in the Winter Palace was dismantled in 1895. I didn't know about the pavilion at Buckingham Palace! Both are charmingly bizarre; a pity neither survived. There is a gorgeous Pompeian room in the palace of Grand Duchess Nikolaevna and a beautiful book about the palace by Zoia Belykova. It's a pity that neither of these rooms survived but I guess the style went out of favour as others came in. How long did the pompeian dinning room survive before it was changed to the Rococo style we see now? I'm guessing it was around the time Nicholas II & Alexandra took over the apartments?